I should mention at the outset, that there is no bran in these bran flakes. I should probably have put air quotes around it. We’re making “bran” flakes today. Yep, that’s a lot more accurate. The low carb cereal we are making today is actually composed of Almond Flour, Flax and Hemp Seeds and, how should I put this? I’ll just say it. The secret ingredient is Parmesan Cheese. But don’t knock it before you’ve tried it! You don’t actually taste the cheese in this cereal at all. But it does bind the ingredients together quite nicely. To make these “bran” flakes, you start by mixing together 1/4 cup Almond flour, 3 TB Flaxseed Meal, 1 TB Hemp Seeds, 2 TB Sugar-Free Sweetener, 2 TB Parmesan Cheese and 1/8 tsp Salt in a medium sized bowl. Add 1 TB water and mix well to combine. Let it rest for a few minutes so that the water can be absorbed. Press the dough into a ball and place it on top of a silpat silicone mat. Cover with a piece of parchment paper and roll the dough out as thin as you can. Bake in a 300 degree F oven for 6-8 minutes until the edges of the dough just start to brown. Remove the pan from the oven and open the oven door to let out all the heat. Then pre-heat the oven to 225 degrees F.
Let the dough cool on the pan for 20 minutes and then crumble it into flakes. Bake in the 225 degree F oven for 35-45 minutes until the flakes are medium brown in color. Leave the flakes out, uncovered, for the next 12 hours to allow cereal to crisp up more. Add a few berries and pour some nut milk on top and you’ll have yourself a healthy low carb breakfast. This yummy low carb cereal has just 97 calories and less than 1g net carb. Not too shabby for a bowl of bran flakes. Sorry, I meant “bran” flakes. 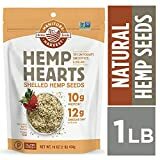 If you likes this low carb breakfast recipe, then you may like my recipes for Hemp Seed Porridge, Waffles, or Breakfast sandwich. How fun!! I love creative recipes that solve dietary needs… parmesan cheese is genius! I’ve been on a roll making all-nut-granola, but haven’t tried making “flake” cereal. I’ve gotta try it!! Flake cereal is so good. And I’m going to show this comment to my husband. I keep telling him I am a genius but he never believes me for some reason. What a great recipe! I wouldn’t have thought to use parmesan as a binding ingredient. Genius! What a nutritious and yummy cereal! I would never had guessed Parmesan to be the secret ingredient! I gave up breakfast cereal a long time ago due to the carbs and sugar. This is amazing and excited to try it! Wow, I had no idea you could make a low carb cereal!! I love all the ingredients in these and how low in calories they are! Yep, if you miss cereal enough, you’ll figure out how to make it! I love the fact that you will tackle even the most high carb foods.